Why are Autoclaves more in demand than other Sterilizers? A sterilizer is a general term for any equipment that can sterilize. A common method to sterilize equipment is by autoclaving. 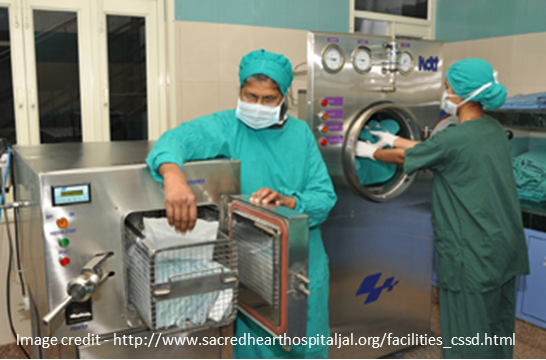 The preferred principle for sterilization is through heat, the autoclave being the most widely used method i.e. using saturated steam. Autoclaving is the use of pressurized steam at high temperature to kill fungi, microbes, spores, bacteria or viruses that are hard to destroy using conventional disinfection methods. Autoclaves use only steam to disinfect, while other sterilizers may use high pressure, friction, chemicals, filtration or a combination of processes to sterilize a surface. Why are autoclaves more in demand especially in small hospitals? Choosing the right sterilizer depends on the sterilization requirements (i.e. what items need to be sterilized), sizing needs and how much space is available for storage. The chamber in the sterilizer needs to be at least a little more than the length of the longest instrument that will be sterilized. Both autoclaves and sterilizers use same technology, where sterilizers are expensive and better used in large scale applications. 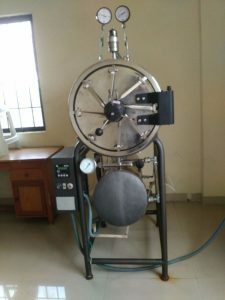 Sterilizers use steam or other gases or a mixture of both to do the sterilization process, hence the process is more time consuming and expensive. Sterilizers are complex in construction and consume more electricity. The operating time of sterilizers are more since it has many steps to eliminate the spores like heating, vacuum etc. However, sterilizers penetrate more, safer, more effective and preferred to be used in high end application in hospitals and pharmaceuticals and etc. An autoclave uses the power of steam under pressure, to kill bacteria, spores and germs resistant to boiling water and powerful detergents. Autoclave can sterilize solids, liquids, hollows, and instruments of various shapes and sizes. They are mostly used in hospitals for sterilization of surgical dressing and surgical instruments, containers and closures. They are also used for the sterilization of a majority of injections which can withstand the pressure of 15 lbs. /sq. inch for 30 minutes. Autoclaves are relatively inexpensive, very easy to maintain, easier to transport and are very reliable. Autoclaves use steam to disinfect spores at temperature more than 100 degree and are more robust. 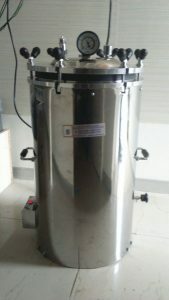 Hence autoclave is most widely used method to sterilize equipment in small and medium hospitals, which are looking for a sterilizer that is cheaper, easier to handle, effective for basic sterilization needs. All types of sterilization methods have their advantages and disadvantages, but all are equal in their importance to the success of a medical facility since they are suitable for sterilization of different types of items. Autoclave/ Steam sterilization Steam sterilization is primarily used for glassware, surgical instruments, and medical waste. Autoclaving destroys microorganisms more efficiently than dry heat and hence the material is exposed to a lower temperature for a shorter period. It is used for sterilization of a large number of official injections. Equipment or parts of rubber and plastic such as, Nylon and PVC can withstand the temperature and the pressure required for sterilization. A large quantity of material can be sterilized in one batch using a big autoclave. On the whole Autoclaving is relatively inexpensive, Non-toxic, microbicide and sporicidal. Due to heat and moisture autoclaving may not be suitable for certain types of plastic and may cause melting or spoilage of some sort. It is unsuitable for sterilization of powders and oils. Some plastic ware melts in the high heat, and sharp instruments often become dull. Moreover, many chemicals breakdown during the sterilization process and oily substances cannot be treated because they do not mix with water. ETO/EO sterilization This method uses Ethylene Oxide gas to sterilize items that cannot withstand the high temperatures or humidity created using other methods. This is commonly used for electric components, plastics, and cardboard. · Can sterilize heat of moisture sensitive medical equipment and products, that cannot be steam-sterilized. · Gas can penetrate materials to sterilize packaged instruments or items. · Need to be handled with care & precautions. What medical equipment are needed to set-up a Cardiac Hospital or Cardiac Unit? Should I ask for the thyroid guard? Why choose biphasic defibrillator over monophasic defibrillator?